Madagascar Hissing Cockroaches are native to the island from which it gets its name – Madagascar. Madagascar Hissing Cockroaches are 2 to 3 inches long and weigh up to 0.8 ounces. These amazing insects are nothing like the cockroaches that inhabit human dwellings. In fact, 99% of cockroach species do not inhabit human dwelling. 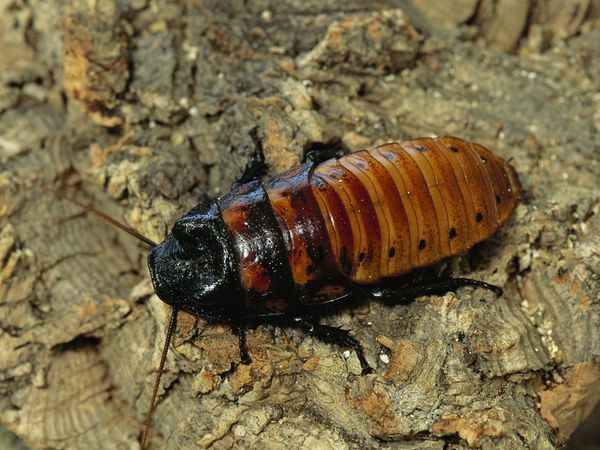 DESCRIPTION: Madagascar Hissing Cockroaches are brown and oval shaped. Their exoskeleton is hard, waxy and very thick. Like other insects they have six legs. They do not have wings and they have two antennae. Males also have “horns” on their heads that they use to battle other males. They are not the typical “horns” as seen on hoofed mammals. These “horns” are more like large bumps, or tubercles, behind their heads. They are sometimes called prenatal humps. However, like a hoofed mammal with horns they will use the “horns” to push other males around while competing to protect resources. When battling, the males emit their distinctive hissing sound and the winner hisses even louder over his victory. They make the hissing sound by expelling air through their breathing spiracles on their abdomens. Hissing is also part of their mating rituals and is used as a cry of alarm. Most insects make sounds by rubbing body parts together so making sound via air expulsion is unique to the Madagascar Hissing Cockroach in the insect world. They are nocturnal. They forage for food on the forest floor at night. During the day they hide under leaves, logs, and other forest debris. RANGE: They are only found on the island of Madagascar, which is off the southeastern side of Africa. HABITAT: Madagascar Hissing Cockroaches live on lowland, tropical rainforest floors hiding among the dry leaf litter. DIET: Herbivores – fruit and plant materials are their diet. FAMILY LIFE: Madagascar Hissing Cockroaches begin life in an unusual manner. Females create and carry an ootheca, which is a cocoon-like egg casing. They carry this inside their bodies with the eggs and neonatal nymphs. At the right time they give birth to as many as 60 live nymph cockroaches. Nymphs look very similar to adults but they will shed their exoskeleton six times before becoming an adult, which is about 6 or 7 months. They live in colonies but males will establish and defend territories within the colony. LIFE SPAN: The average life span is 2 to 3 years in the wild. In human care it is about 5 years.